Another Beautiful Day in Paradise. We had clear blue skies, temperatures in the high 80s and almost no breeze. 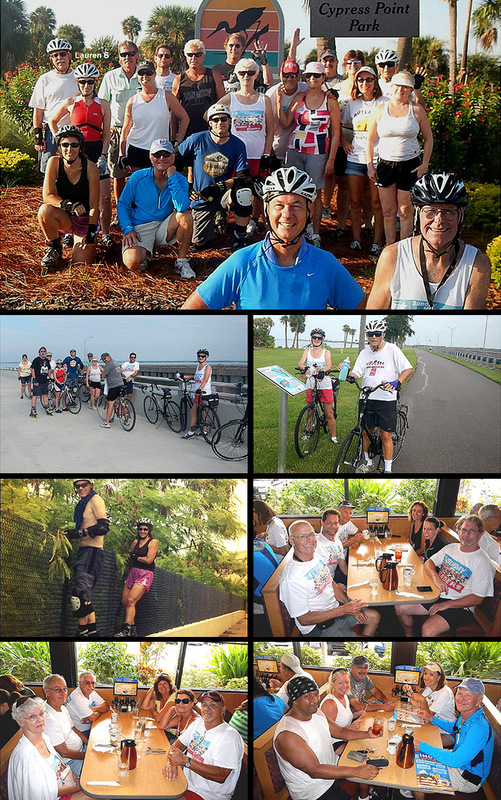 Bladers/Bicyclers Dee T, Lauren S (1st time) Andrew F, Laura P, Dimitri F, Jim H, Joe W, Carol J, Rick P & Ginnie S, Rob H, Barbara M, Joanie C, Steve G, Deb B, Wendy H, John L, Rob G, Jeff B, Bruce M and Breeze (not in picture). Welcome all. We headed off on the usual route. Everything was going smoothly but we came across a big puddle of water in the trail with concrete walls on both sides. This was no problem for the bicyclers but the bladers had to climb up on the wall and work their way across. For some reason Ginnie S set the pace at 14 to 15 mph. She kept it up without stopping for 5+ miles. One of the older bicyclers that just had to keep up with her almost passed out from the heat and had to rest an extra 10 minutes or so at the bridge. Most everyone did the round trip to the bridge and back for 12+ miles. A few went further and a few did less. There were 6 bladers and 15 bicyclers today. We Brunched at the IHop on W Spruce as planned. As this was the first time there, a few got lost but finally all got to the IHop. Rick went ahead and made reservations for us so we got in within a few minutes. Thanks Rick. We got seated at 3 booths. The booths would take 6 people each. Service was pretty good and the coffee flowed freely. Parking was a little tight but we didn't realize you could park at the two adjacent businesses also. Ratings were all from 9.4 to 9.8 except we had one 3. We decided to give IHop a 9.5.